Innocent Simiyu has been reinstated as the Kenya Rugby Sevens nation team coach. Simiyu's return was announced Monday evening by Sports CS Rashid Echesi. 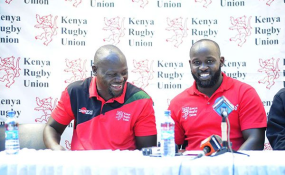 He had been sacked last week by the Kenya Rugby Union following a fallout over the Sh20 million sponsorship deal by the Brand Kenya. The decision to reinstate Simiyu, Mr Echesi said, came after his meeting with board of directors of the KRU led by vice chairman Thomas Opiyo and the chief executive officer Ronald Bukusi. "We resolves that Innocent Simiyu to be reinstated as the head coach of the 7s Shujaa national team. The ministry to work with KRU and the pending payments of their salaries and allowances," said Mr Echesi. He said in future, the federation will consult with the ministry before such key decisions are made. The sevens team is set to take part in the Sevens World Cup that will be held next month in San Francisco, United States. The players had resolved to boycott the preparations for the world cup and not to play under a new coach. A week ago, Tourism CS Najib Balala ordered Brand Kenya to cancel a Sh20 million deal to the Shujaa. The Shujaa players had masked the Brand Kenya logo during the Paris sevens leg after the union failed to pay their salaries and allowances in time. The players later said while Brand Kenya had released the money to the union, KRU had failed to play its part.